May I just rant about pants for a second? I have two pairs of pants – one brown, one beige – that I wear to work, neither of which are particularly flattering or nice. I mean, they’re okay, I guess. In terms of the workplace, they’re only a step above jeans by virtue of the fact that they’re not jeans. I’m always relieved when Friday arrives, because I feel justified in wearing jeans to work on Fridays, though I’ll sometimes wear them to work during the week, too. In addition to the brown and beige pants, I also have two pairs of black pants that I consider to be “work” pants. They aren’t great-looking, either (one is a pair of cords, and the other is a weird pair of black jeans, which I consider to be nice enough to qualify as not-jeans). All four pairs of pants are uncomfortable in one way or another. I’m most comfortable wearing regular jeans or leggings; I’ll actually put on leggings once a week more often than I will the black jeans. During an average five-day work week, I’ll rotate through them… the brown, beige, black, leggings or weird black jeans, and regular jeans on Fridays. My ridiculous angst over pants is due to the fact that I HATE SHOPPING FOR PANTS. I know that it wouldn’t hurt to invest a little in my work wardrobe, but it’s hard to muster the enthusiasm when I’d rather go to the dentist than go shopping for pants. If my work attire could be anything I wanted, I’d go in work-out/athletic clothing. I do, in fact, have one pair of flowy black athletic pants in some kind of stretchy spandex-blend that I can get away with wearing to work. Unfortunately, they’re old and worn-out to the point where they’ve developed a pill issue. And look at that! They’re beautiful, and they’re only $79.20, because they’re 10% off! WHAT A STEAL. I partially went through the process of ordering them, just to see. Ground shipping, the least expensive shipping option, is $6.95, bringing the pre-tax subtotal to $86.15. Add an additional $5.60 for (California) sales tax, and these pants cost $91.75. In my view, it’s a cruel joke to make comfy, work-appropriate yoga pants and advertise them for $80.00. I mean, I just can’t. And this is one of my issues with shopping for work clothing: I’m willing to throw eighty bucks down for some things, but pants aren’t one of them. I don’t like to spend money on clothing. 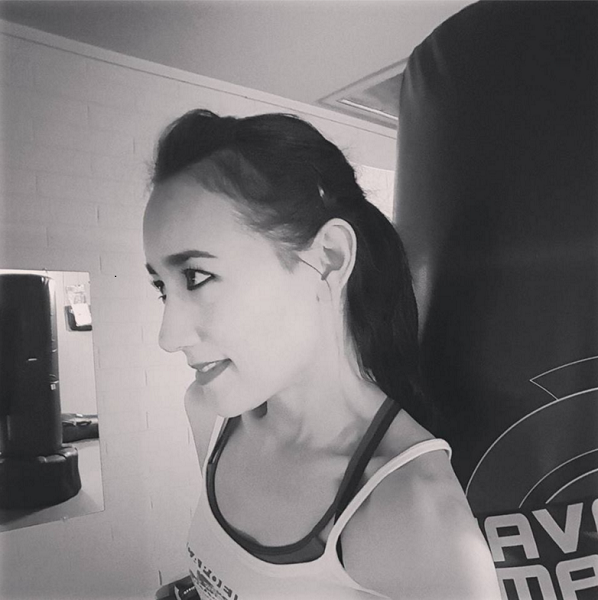 I’m guilty of spending more than I should on things like skin care products, perfumes, concert tickets and food (on high-quality groceries, and on eating out), and I’ll splurge on a pedicure every once in a while, mainly to get the lower leg and foot massage. I’m not a clothes-shopping person. I’m not a jewelry person or a shoe person, either. I do like bags, but not expensive ones. I like Target, the Goodwill, Ross, Marshall’s, and it’s just painful shopping for pants in those places. The very idea of flipping through a hundred pairs of pants that all look the same (except that they’re not) leaves me cold. There are other, random places, sure. One store in the mall I venture into every once in a while is Charlotte Russe, because I usually find things there that I like, and often, those things that I find are on the clearance rack. And I like to get jeans at Old Navy (when they’re having a sale)… Old Navy and Target. I still have many of the dresses and skirts I habitually wore to work a decade ago, but I’m not into wearing them anymore, for some reason. Not only that, but there’d be a strategic issue with wearing skirts to work now: I sit on a physio/balance ball instead of on a chair, and my desk doesn’t have a “modesty panel.” My desk is out in the open, facing people walking into that area. Are you getting a visual here? You know how I’m prone to embarrassing incidents at work? Yeah. That would totally happen to me. So, pants. No crotch shots. PANTS. 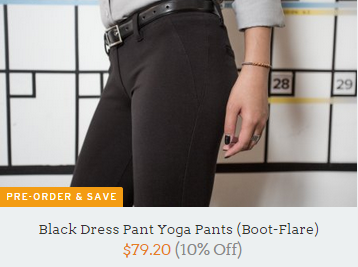 While I love the idea of these “Black Dress Pant Yoga Pants (Boot-Flare) $79.20 $88 (10% Off),” there’s just no way I’m spending a total of $91.75 on ONE pair of pants when I could get several from any of the cheaper places for that same price. I guess I know what I’m doing one weekend in the near future. ← La Tour Eiffel, she is everywhere. I too can not wear jeans until Friday! And what a liberation that is when Friday roles around! I have adapted to wearing leggings. Leggings have always felt better to me then dress pants but nothing compares to good ol jeans on Fridays! The dress pants I do don occasionally are riddled with bleach stains. Working at Head Start I help the teaching staff by making the bleach solution for doing the dishes. Bleck! Because as careful as I am some drops of bleach always find their way to my black pants…and often near the crotch area! I learned quickly the power of a black sharpie!!! Thanks for another amazing post in my inbox!!! Hi Jules! Isn’t there just something about dress-down Friday that’s so satisfying? Another friend also said that she wears leggings a lot. I like leggings, and I’m happy that boot season is almost upon us so I can wear them more often. For some reason, I mostly wear leggings with boots. =) Ugh, clothes getting ruined at work routinely would get old really fast. Haha, “the power of a sharpie” – this begs for a Monica Lewinski joke, so I’ll leave it here. This is what happens when I’m tired, lol! You’re welcome, and thank you for reading, as always! !